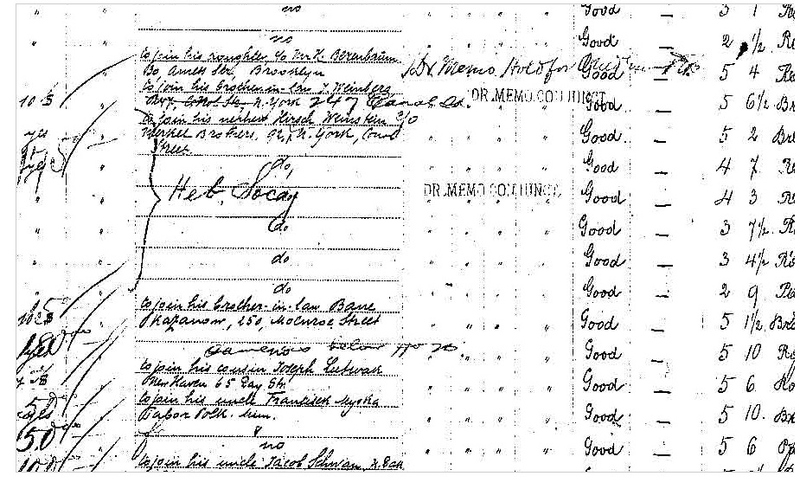 I was looking up the name Sigal on the Ellis Island database, and found myself looking at the manifest of a ship, the Gregory Morch, which began its journey in Odessa in late October 1906, and took a month to travel through the Mediterranean, stopping at Greece and Sicily, and then went on to New York. Only two trips were made with this ship, both in 1906, before it was scrapped. Mindel Sigal was a middle-aged woman travelling alone to her daughter, and her name proved difficult to follow in America. Then my eye travelled down the page to other people from Odessa, particularly a young widow, Leah Rifke Ochsenhandler, usually Oxenhandler, 31, and her five children, Samuel 12, Isaac 10, Idel 7, Mania 5 and Basia 2. 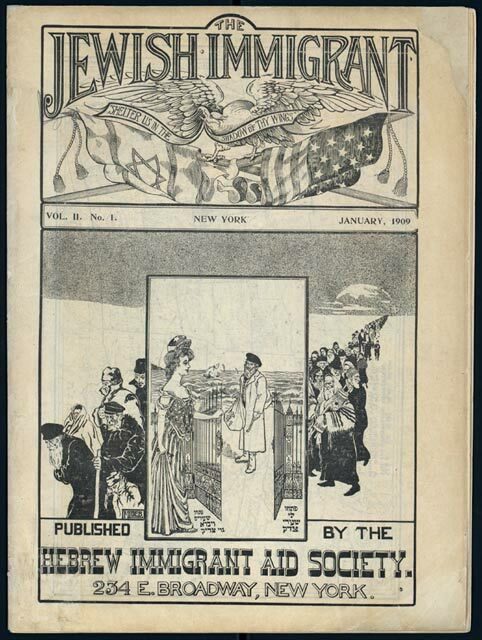 This was the only family on the page where, instead of the address of a family member or friend in the United States, it simply said Hebrew Society. She was held for special enquiry as an LPC or ‘likely public charge’. The Hebrew Society may have been enlisted to help her while she and her children were being detained. 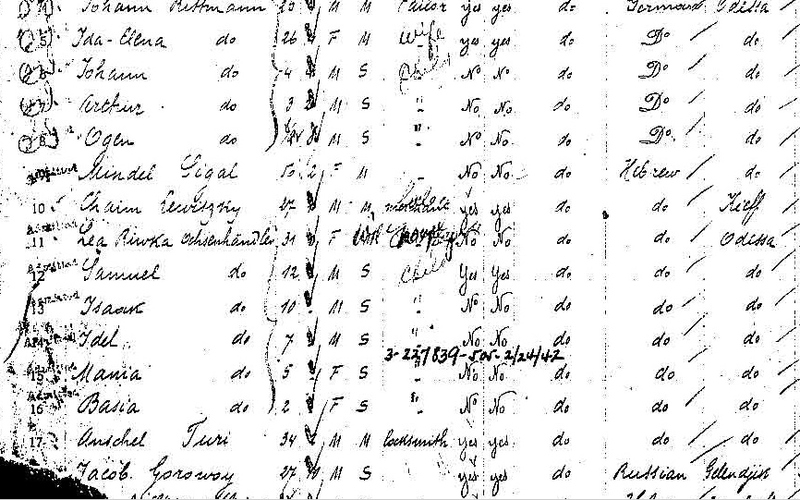 There was one Oxenhandler in the Odessa 1905 pogrom death records, Osip Oxenhandler (Оксенгедлер, Oksengendler) on one of the last two images where the names were not in alphabetical order and obviously added after the others. Most of the names have the age and birthplace like the others, but in this case they are missing. So if he was identified after the others it seems that the identifier did not have this information. I wondered how Leah was going to manage in New York without any relations. How could she make a living and look after her five children? I have always assumed that no one would take the journey to America without having a sponsor in America, a family member or friend, someone who could help them until they could support themselves. I thought having a sponsor was a condition of being allowed into the country and if ‘Hebrew Society’ was written in the space for a friend or relation, it meant that the Hebrew Society had agreed beforehand, possibly from Odessa, to sponsor the person until they could support themselves. However, when I looked up the history of the Hebrew Immigrant Aid Society, I found no mention of agents from the society in Odessa or at the ports around Europe. Their main work was at Ellis Island, providing food, translators and preventing deportation by providing temporary accommodation and information about work. It seems that Leah had taken a gamble on being able to support herself and look after her children in New York. They arrived in the middle of winter, 24 November 1906. The Hebrew Society did look after Leah and her family, giving her accommodation at the Hebrew Sheltering Guardian Society house at 229 E. Broadway. But on Christmas Day 1906, a month after they had arrived, Leah applied for her three middle children to be admitted to the New York City Hebrew Orphan Asylum. The oldest child, Samuel, was considered to be old enough to work. The mother kept three-year-old Bessie with her. According to the orphanage admittance form, the children were rejected because of a case of measles in the family, and were not admitted until March 1907. The application also lists the parents’ names, Joseph and Rifke, born in 1870 and 1876, and the father’s death in 1905, killed in the massacre. The only other time I had come upon a reference to someone killed in the massacre were the parents of the Scheindless brothers who were also at the Hebrew Orphan Asylum at the same time as the Oxenhandler children. The residence of the mother is 229 E. Broadway, the Hebrew Sheltering H (blotched out). In the 1905 census, the Hebrew Sheltering Society housed about 20 old people, several over 100, and a couple of school-age children. 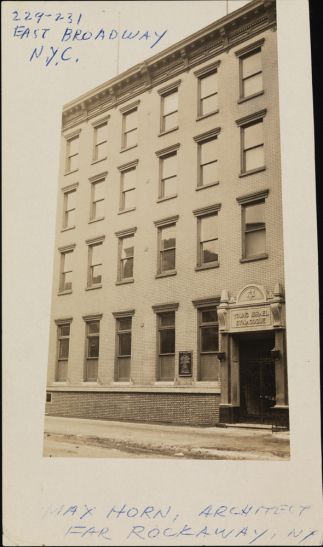 By 1910 the Hebrew Immigrant Aid Society used the building for free meals and helping people find jobs, but was no longer accommodating people. A final remark on the form was that the mother has $170 with which she wishes to establish a business but is unable to care for her five children and has no relations. It is also clear from the form that Bessie, born 5 September 1903, was admitted on her fourth birthday in 1907. 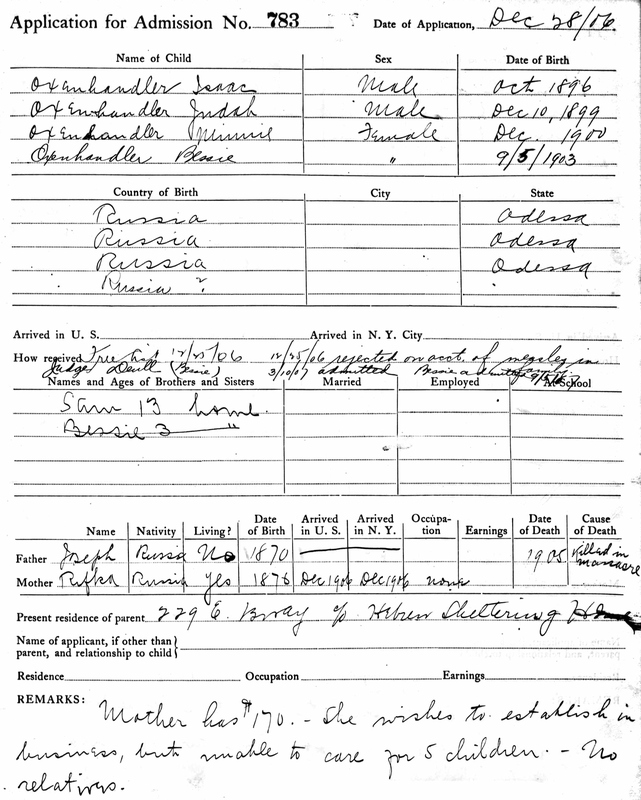 On her separate admittance form, her mother is listed as applicant, but under the column that states whether the child is committed or surrendered, it appears to say that she has died, less than a year after they had arrived in the country. Possibly Rifke had applied while ill to have Bessie admitted, but then died before she entered the asylum. There is no death record for Rifke, which may be a failure of the record-keeping system, or, sadly, one begins to think of a suicide like drowning in one of the rivers surrounding Manhattan where the person may never be found. 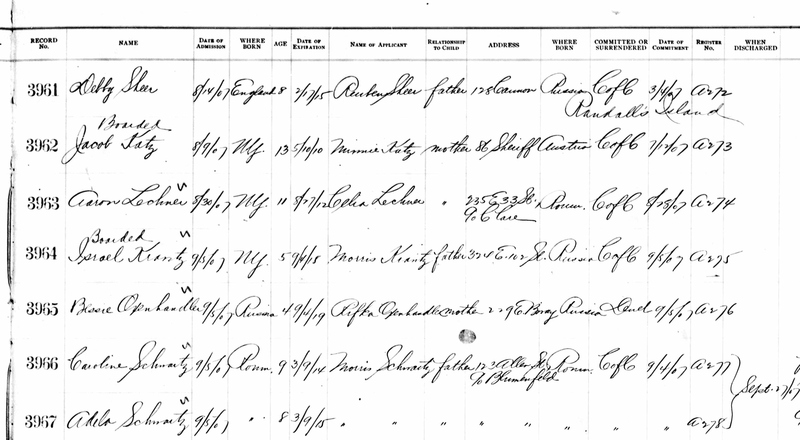 The five Oxenhandler children only appear sporadically in the records – the four children at the Hebrew Orphan Asylum appear on the 1910 census in the orphanage. Idel had become Judah (and later Julius), Mania became Minnie, and Basia became Bessie. Isaac kept his name until later when he more often used Isidor. There are discharge forms for Julius and Minnie who left the orphanage in 1916. Julius had a job with a Jewish farmer, Jacob Bloch, in Parksville, New York, in the Catskill Mountains, a little town whose main street has now been bypassed. However, by 1918, when Julius filled in his World War I registration, he was working as a machinist in Brooklyn and married. In 1920, he was living with his in-laws, his wife and his baby daughter, in Brooklyn, but then he and his family disappear from the records. None of the other children appear on the 1920 census, and Sam, the older son who did not go to the orphanage, does not appear at all. It is as if he disappeared with his mother, or changed his name completely. There is one Samuel Oxenhandler of the correct age in the 1940 census, a hotel clerk with a wife and a son who was an electrician, but as that census does not include year of immigration it is difficult to know whether they are the same person. Isaac was the oldest of the children in the orphanage and probably left before 1916. He first appears on the World War I registration as Isidor, in New Brunswick, New Jersey, working as a milkman and living with the owner of the business. Possibly the orphanage tried to get jobs for the children outside New York City. His nearest kin is an aunt, Rose Lebovitz, in Brooklyn. The next record for him is a naturalisation form in 1936. 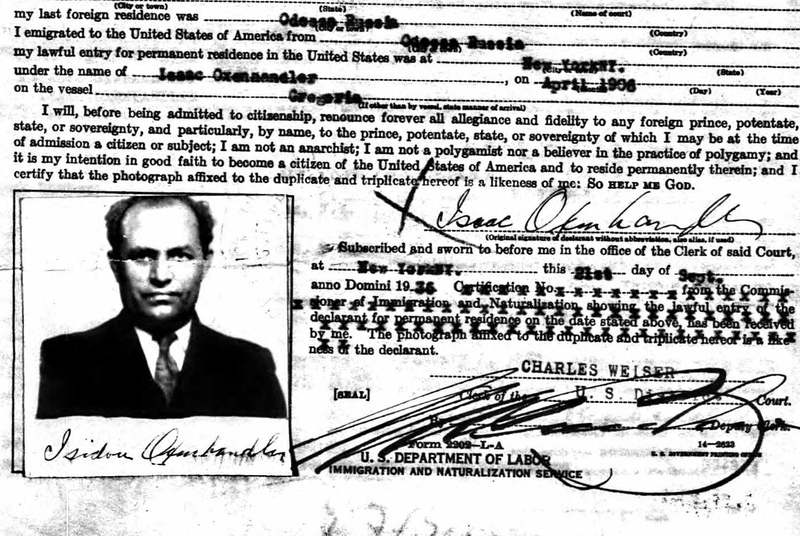 It lists that he was born in Odessa and came to the US in 1906 on the ship Gregoria. He married Stella in 1918, had four children, lived in the Bronx and had his own window cleaning business. He then appears in the 1940 census and the World War II registration. Minnie does not appear after her discharge from the orphanage in 1916. She was withdrawn from the orphanage by her aunt, S Tartakofsky, as she was able to maintain herself, age 15 or 16. 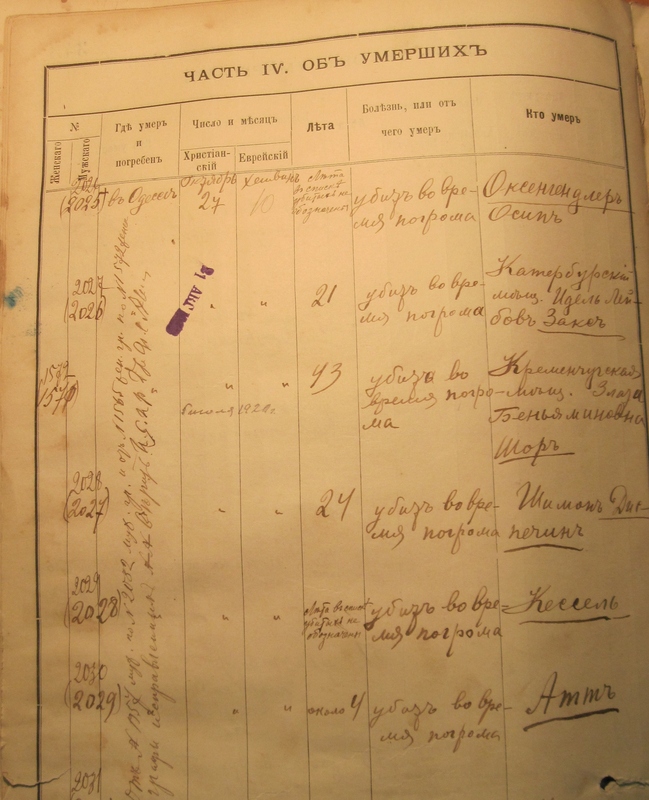 Tartakofsky is a name that appears in the 1904-5 Odessa directory, both a doctor and the owner of an ink factory, although these may not be the same families. Minnie may have married before 1920. There is a Betty Oxenhandler in the marriage records, who married Benjamin Zuckerman. On the 1930 and 1940 census there is a Betty Zuckerman, who is three years younger than Bessie and emigrated from Russia in 1905, and Barnett Zuckerman. He is a real estate broker and by 1940 they have two children. A possibility, especially as there is no other Betty Oxenhandler in the records, and the only Bessie Oxenhandlers are all much older than the Bessie in the orphanage. So, from what began as a horrific story of a murdered father and a mother dead a year later, of five children in an orphanage or out working at age 12 or 13 in a strange country where they did not know the language and had no relations, three of the children, although Bessie/Betty is a guess, seem to have done well for themselves with jobs and families. As there is not another form from the orphanage for Bessie, it is a relief to think that these records do belong to her and that she did have a good life after such a tragic beginning, even if she always had a dark hole inside of lacking a parent’ s love and having to grow up and fend for herself as a small child. Who knows whether she had some memories of her mother and the day she was brought to the orphanage. At least some children did seem to find temporary love and kindness at the Hebrew Orphan Asylum from staff and other children. Like many of the Odessa families who emigrated, the other two children, Samuel and Minnie, disappeared from the records.